The sugar level of the mix or recipe must be between 13-17%. Mixes with sugar levels outside of this range will not freeze properly. If less than 12%, the machine may over-freeze the mix. If greater than 18%, the machine will have difficulty freezing the mix. When using a custom recipe instead of a commercial mix, Vollrath strongly recommends using a refractometer to measure the sugar content. Alcohol is an anti-freeze. Replace no more than 1/4 of the water required in the recipe with alcohol. When using milk-based mix, for food safety, turn on the max temp setting in the menu options. To set refrigerator, turn on the machine. Press the right button to start the augers. Press the left button to select slush or cold drink. 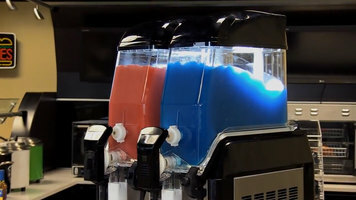 These are some examples of slush or cold drinks. For slush mode, press up or down to select a density setting, slush 1 being less dense and slush 9 being more dance. The machine will enter a calibration mode. The machine will not enter a calibration mode with chilled mix. Vollrath recommends calibrating with an empty bowl prior to pouring in the mix. The display will alternate between wait and auto. The machine will calibrate for approximately 1 minute. Calibration is complete when the display shows the selected slush setting as in the example. For the drink mode, press the up or down button to select a temperature setting. The lower the setting, the colder the temperature. Add mix by removing the cover and pouring 3 gallons (11.4 L) of mix into the tank. Do not overfill the tank. The mix level must be below the top of the blade on the vertical auger. Place the cover on the tank. Make sure the metal contacts at the back of the cover are on the outside of the tank. The contacts must make a circuit with the contact wires for the auger and refrigeration system to operate. Product will be ready to serve in approximately 60 minutes. 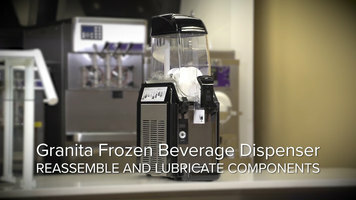 The time it takes to be ready is dependent upon many variables including the mix temperature when poured into the tank, the ambient temperature, the amount of sugar and alcohol in the mix, and the slush or cold setting. The product is ready when this icon disappears from the display. Pull the spigot handle open to serve. Do not operate the machine when the mix level is below the minimum fill sensor. For more information on this machine or our other products, please visit us at Vollrath.com.